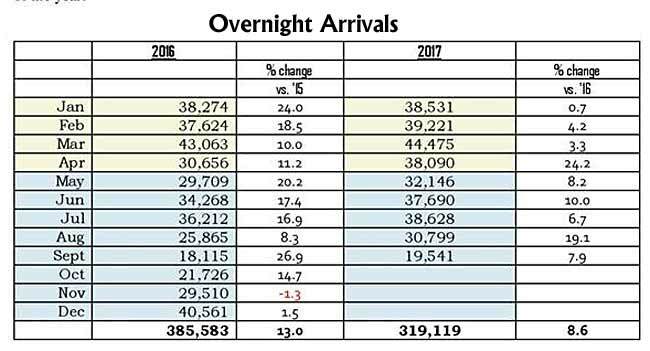 For the first 9 months of 2017, the tourism arrivals continue to show a positive trend.The latest statistics show there was a 7.9% increase in Overnight arrivals in the month of September, representing an increase of over 1,400 visitors. In September 2017, arrivals through the International Airport increased only slightly, as the number of incoming flights were impacted by the threat of storms in the region in the early part of the month. An increase in the arrival of visitors thru the land borders in Northern and Western Belize assisted in these gains during September. 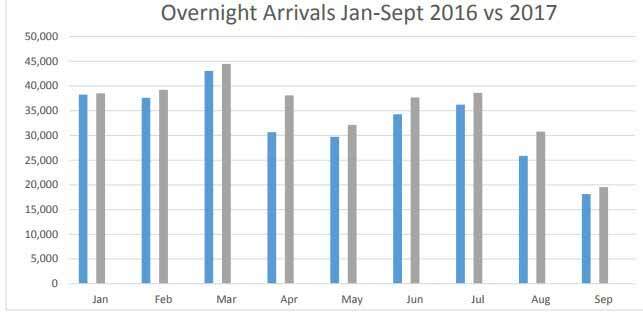 The cumulative overnight arrival increase was 8.6% through the first 9 months of the year. 3rd quarter (July to September) comparisons to 2016 reflect a 10.9% increase in overnight arrivals.Despite this quarter being the traditional low season; with increasing growth; this is testament to Belize continuing to emerge as the go to Curious Place destination. year. These numbers reflect visitors arriving to both Belize City and Harvest Caye Ports. Overall there has been a 3.7% increase in total cruise passenger arrivals through the first 9 months of the year and a 6.1% third quarter increase when compared to 2016. Jet route that will commence on November 3rd, 2017 between Belize and Calgary and the upcoming Air Canada route from Toronto in December 2017; coupled with the vigorous marketing activities of both the BTB and its valued stakeholders.